The conditions could not have been better. A sky full of sunlight, a gentle breeze, and a fresh coating of powder covering an entire lake of open skiing that was just waiting for me to go on it. I was nervous the poles and the skis would be too long, but they actually fit pretty well. I hooked in my feet, that were snugly wrapped in boots that were entirely too comfortable to be ski boots. I guess technology has come a long way since I actually strapped on a pair of boots and skis. I had my husband snap a few pics before I headed out on my next great adventure, and sliding one ski in front of the other…I was off. My hair was blowing in soft waves from around my face. 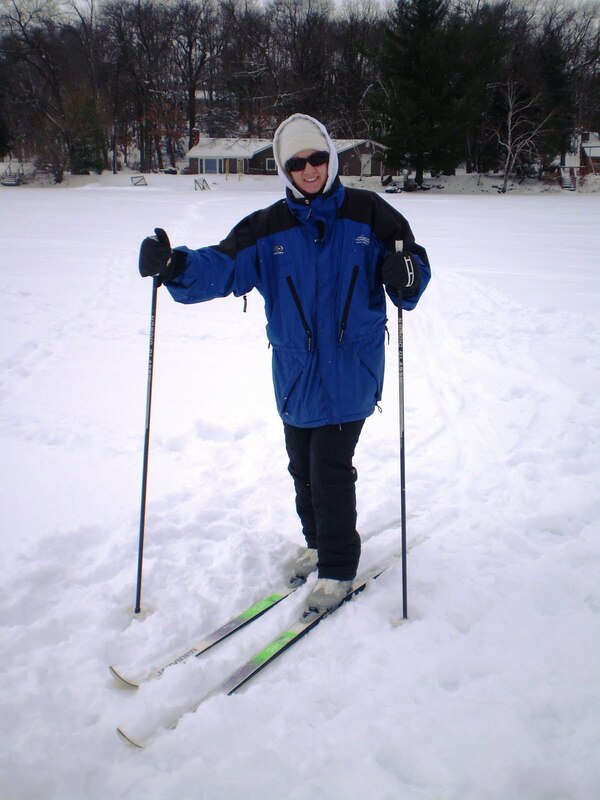 (note the picture) I was gliding effortlessly through the snow placing poles down in perfect sync to the alternating skis and the more comfortable I got, the faster the movements became. The powder made it difficult to explode into sprint speed, but I was working up a sweat. About five minutes out from the ice-fishing crew, I glanced over my shoulder to see how far I had gone, and when I turned back around, in mid-stride, the tips of the skis congratulated one another and took me down. Mind you…it had taken me five minutes to get about 3 football fields away from my family, so I was not moving along the snow as fast as my effort might have indicated, and I was well within visual contact. I lay in the snow for a moment relieved that I hadn’t decided to learn half-pipe snowboarding, and I got on my elbow to get up. That was when I remembered that I have been nursing a bad back…one that flares with immobility every few months or so, and it was absolutely not going to let me up off the ice from a sideways position. Like I said, it has been a while since I have been on skis, and I don’t know how, but somehow I forgot that it is physically impossible to get on your knees (except from a sideways position) with skis on your feet. The front…and then the back….and then the front of the skis do not bend at the whim of a flailing ex-athlete. I lifted the poles up and put them into the snow to see if I might be able to pull myself up from the ground with upper body strength. Note to self: You need your back for EVERYTHING!! “I need to get these skis off,” I brilliantly assessed, and I reached for the back button that I remembered from my downhill skiing days. No back button. YOU ARE CROSS-COUNTRY SKIING YOU IDIOT!! So while the poles were flailing and the skis were whirling around like helicopters, my family noticed my turtle-on-the-back positioning. As heart-warming as it was, I have to say I was not all that thrilled to see my nine-year-old running through the snow toward me. The snow rescue by my son was not going to happen…not on a five-minute cross-country ski stint. I found a position that worked to get the ski off and then I was able to get up and get turned around back toward home. My son stopped halfway…my victory in this epic battle. I caught up with him as we headed back. He told me that he was worried about me and that dad thought that I had hurt my back. “No, my back is okay,” I lied. I was just going to file my accident report with my husband, but as soon as I got back to the ice-fishing tent, our littlest emerged soaked on her entire right side. She had stepped into the ice-fishing hole, and my morning cross-country ski adventure was brought to an end. I did manage to get back out on the lake for a wonderful 40-minute ski trip complete with music from the ipod and light snow showers. It felt great, and I am looking forward to at least another outing or two this year, and of course multiple trips next year. Cross-country skiing is awesome, and something that I feel a thirty-four year old should be able to do whether it is on a competitive or on a recreational level. My back issues have become too severe to ignore any more, and I want to enjoy learning new activities like this one, and I really hope I can figure out what’s wrong so that I can do what I need to do to get it fixed.